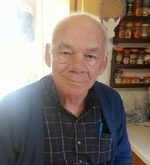 Gerald Joseph Raymond Richard "Ray" - 74, Truro Heights, died January 31, 2018 at home. He is survived by wife, Linda (Vaughan); daughter, Tara Richard, Lw. Sackville; sons, Michael (Colleen) Richard, Dawson Creek, BC, Derek Richard, Onslow; stepdaughters, Corinna Simon, Sydney, Alaina Jessome, Florence, NS; grandchildren, Nicholas Richard, Emily Richard, Cole Jessome, Kennedy Jessome; mother, Alexina Richard, Woodstock, NB; sister, Jean Domet, Woodstock, NB; brothers, Paul, David and Kevin Richard all of Woodstock, NB. Ray was predeceased by his father, Gerald Richard; brother, John Richard.